The bubble installed in the foyer of the national gallery is not an actual “site-specific” installation, but simply the first place to inflate the “Ambulant Inflatable” we created together with the “Village Unhu” people: Misheck Masamvu, Gareth Nyandoro and George. Since you had to access it from outside the gallery, it allowed you to be ON the street but IN the national gallery, a space known in town for being a welcoming place. The “Ambulant Inflatable” is a dispositive that can create “intimate” public spaces anywhere in the city. In such a hiper-controlled and traffic-dominated space as the Harare public space, we thought it could be interesting, to have a cart that works creating places to meet, talk and get together. We create this piece and the possibilities it arises using the same tools -push carts- as the street vendors, who are the only ones actually creating space, city and urbanity in Harare.And using waste usually reused in Harare, that we bought in Mbare: sewn maize meal sacks, usually reused as sacks and bags, and ironed concentrated juice plastic bags, reused for keeping tobacco scraps. The installation of the ambulant inflatable in the national gallery creates an intimate public space, which tries to group the best of the two worlds: the freedom that the national gallery permits together with the openness that the street implies, proposing an invasion of the national gallery by the street and a tolerance from the national gallery for the street practices. We do believe public art is a necessity and not a luxury for any society. With the ambulant inflatable we also wanted to encourage the public art practices in Harare: the ambulant inflatable is donated fully equipped, to the national gallery, so it is available to be used by whoever asks for it. The title of the project (refers to Operation drive the rubbish out), opposed to the idea of doing a “clean up” that consists “taking out the trash”, which basically means the displacement of thousands of people out of their habitats and enviroments. Precisely, the people that really build an actual urban, better life that brings up diversity and chances for the most, instead of creating an elite city built just for the few who can afford it. Inhabiting Plastic Oceans is an art installation designed and built by Basurama for the World Design Capital in Company Gardens, Cape Town during the month of November 2014. For the piece 240 kilos of plastic over 5.000 m of duct tape have been used together with 3 industrial fans to blow it up. In Spain the garbage bag has radically changed in the last 30 years. While in the 80s our home trash was filled in with organic leftovers and broken items (furniture, clothes,….) nowadays the main waste substance in our bin is plastic, whether in the form of bags, bottles or packages. Their properties, their size and the easy way we dispose them make them instantly forgotten. But through each of those decisions and gestures we are actually feeding a monster of mythological dimensions. In 2014 we were invited to create an installation for the World Design Capital Cape Town 2014 closure. South Africa is a country with 2500km of coastline and it is famous for its capes. Cape Point, in Cape Town, is the melting pot where two huge water masses come together: the Indian and the Atlantic Ocean. In recent years this two oceans have been invaded by one of the most non biodegradable contaminants: plastic. Recent studies show that plastic debris has increased a 90% over the past 10 years in South Africa. A large percentage of this plastic waste ends up in the oceans; and has concentrated itself on 5 vortexes causing enormous environmental problems, including the death of 1.5 million animals per year. A cube 3x3x3 meters representing the number of bags that a Cape Town citizen takes home each year. A cube 9x9x9 meters that helps us visualize the plastic trash volume produced in Cape Town in one hour. A cube 12x12x12 (the height of a building of 4 floors) that shows the amount of compacted plastic that ends up annually in the ocean. The structure of the cubes is basically air from 3 industrial fans that blow them up. But the installation comes to life in contact with the wind. The wind smoothly shakes the cubes and once you get into the sculptures you can feel the strength of its waving and changes in the surface. Inhabit Plastic Oceans allows us to plunge into the ocean of our own consumption through these three delicate and impressive sculptures. It helps us understanding the world that surrounds us and to be aware of it, but also helps us to imagine new scenarios and give us shelter to scape away from the landscapes we inhabit. Exhibition at Estampa 2014 art fair in Matadero Madrid, with Galería Moisés Pérez de Albéniz. With the occasion of the Third Meeting of Rectors in Rio de Janeiro, Banco Santander Foundation and Universia invited us to participate for creating a piece of art together with Brazilian university students. Luxo é Lixo (Luxury is Trash) is a project tributed to the visual poem ‘Lixo/Luxo’ of Augusto de Campos. The objective was to reproduce the poetry in an urban scale made up with trash. The selected waste were plastic bag, symbol of daily consumption, discarded in some minutes after taking the groceries home. Part of the plastic bags came from the inhabitants of Urca neighborhood, where we were working, another part was obtained through cooperatives and other were provided by the university students taking part in the workshop. For 10 days students from FACHA and UNIRIO universities collaborated with us in the construction of the piece. Over 4,000 bags have been employed in the installation, which final dimensions are 7 meters high and about 26 meters long. Working with plastic bags in such a large structure was a challenge, because the bags are lightweight, thin and especially Brazil, which makes them more sensitive. Luxo é lixo confront the city, the mountains, make contrast to a way of development, to a way of thinking, we want the piece to interact with all these contrasts, with all these contradictions. The piece was installed at UNIRIO University and also at Urca beach, just under Pan de Azúcar. Basurama participated in the urban arts festival ” Zancat ” in Casablanca ( Morocco) with a workshop – installation in the Anciennes Abattoires , former slaughterhouse turned into a cultural space and managed by the Association Casamémoire . The starting material of the workshop was one of the most abundant waste in the city: plastic bags. The plastic bag is the consumption symbol par excellence, a model and a paradigm metaphor of it. Plastic bags have an average usage time of 12 to 20 minutes , however , can take between 15 to 1000 years to be degraded . Les Anciennes Abattoires are currently in a state of semi-abandonment , although from Casamémoire are working on their recovery. Our goal was to perform a spatial intervention in one of the spaces of Les Abattoirs through various techniques of recovery and reuse plastic bags . The first day we worked with schools in the area , separating the color bags , exercising creativity to make clothing, as well as various resistance exercises to form strings , which eventually would be used in the construction of swings. We start from the idea of ​​re- inhabiting a symbolic and historical space, give it other possibilities while reusing everyday waste to transform it . This was a double period of redefinition , a dialectic that makes us wonder how we relate to the space we use and how we relate to each . An inflatable heart and lung. Installation for the Istanbul Design Biennial 2012 at the Galata Greek School. The Bubble was not actually designed, its shape came out of the plastics actually available at the biennial when we arrived and the courtyard provided to be exhibited. It is inflatedonly using twodomestic fans. The same techniques and materials used to package and wrap were used to build the bubble, allowing us to finish it in one day work and for only a 10€ cost.Taking care of waste is an act of love that transforms it into something desirable instead of deplorable. Using waste for building the bubble was a way of proposing a new way of looking at the biennale. No one thought about the waste as waste, not paying attention to it when discarding, neither once collected to be used as building material. The bubble was projected to be used as an urban intervention dispositif. We invite anyone explore this tecnhique, improve it and use it for that purpose or others. Is cheap, easy and very available, since about 300 million plastic bags are discarded in Istanbul every year. Any plastic lasts longer that eternal love, in every tale we should be able to make desires: turn pumpkins into carriages or stones in strawberry and cream tarts … or turn discarded plastics in glass castle to play in. IN LO<3 WE TRASH is an artistic project to make the duality Consumption / Waste and its social and environmental impact visible. The objective is to raise awareness of waste production and provide a better understanding of waste as a resource. We believe that making what is hidden or ignored visible is essential and a first step for social consciousness. In the case of In Lo <3 We Trash Gdansk the origin of the material used was double, from one side plastic coming from the previous exhibition that was held at Amberexpo; plastic used for covering carpets, stands and other equipment …. kilos of already packed plastic for its transport to the landfill. On the other hand, plastics and shopping bags coming directly from the landfill Szadolki. We stayed as artist on residence at Łaźnia 2 center for arts and education located in Nowy Port. We have worked in their installations together with volunteers and college students. During the first week we focus on designing, patterning, cutting and pasting the infinite plastics that compose the inflatable. Abstraction, the sound of tape being cut and precision dominate the workshops, but also creativity and imagination. Once all the pieces that formed the glass castle were finished, we have moved to Amberexpo, exhibition center where the Festival Re:Miasto (Re-City) was hold. Re:Miasto Festival aim was to face new waste management system models in Poland and to emphasize the need to reduce waste production on our consumer society. The Festival was structure as cities are, with streets, playgrounds …etc we got 150m2 for our intervention, that would pool reuse, creativity and art, but integrated in the city urban structure. We worked in designing and creating a playful space, a space of possibilities, with corners to be and spaces for sharing. We built an inflatable Glass Castle, a space within the city, which is related to it through this fragile plastic, but at the same time distancing us from it thanks to its transparent membrane. Getting into a parallel world where we are the main actors and in which space is designed and used according to our desires …. because every city needs a place where wishes could be reached, where dreams turn into reality. According to Bangkok Metropolitan Administration every day more than 600,000 plastic bags are used in Bangkok (a city with over 9 million inhabitants). Most of this bags become a residue in an approximately time that goes between 12 to 20 minutes. According to city officials, its annual disposal costs more than 600 million baht (18.5 million dollars). Plastic Bang! Kok project used plastic bags, a daily symbol of harmless hyperconsumption, as the smallest singularity from which explode and expand. Plastic bags as the only raw material for building an urban scale intervention that brings us closer to the duality CONSUMPTION / WASTE and its social and environmental impact. Display this garbage from under the sink into an urban scale intervention, because with no coincidences it has itself an urban scale! How many football fields occupy the dumping sites in the peripheries of cities? Some monsters feed themselves on fear, ours -as in Miyazaki’s film Spirited Away- grew as the consumption of plastic bags get bigger. To visualize the mass and daily use of plastic bags and become aware of their implications, we built an inflatable Monster Garden, fragile, tender, scary, maybe, but with the disturbing point of things you know should not be where they are. During the project we worked with two bundles of 60 kilos bags filled directly from the landfill. The profile of the bags reflect the consumption patterns of the city 1/3 of the stock was up to color bags from shops consumption, ⅓ of white and transparent bags from supermarkets and plastic wraps and ⅓ of black trash bags. These percentages and the particular characteristics of these bags were reflected in the size and appearance of each of the monsters built. 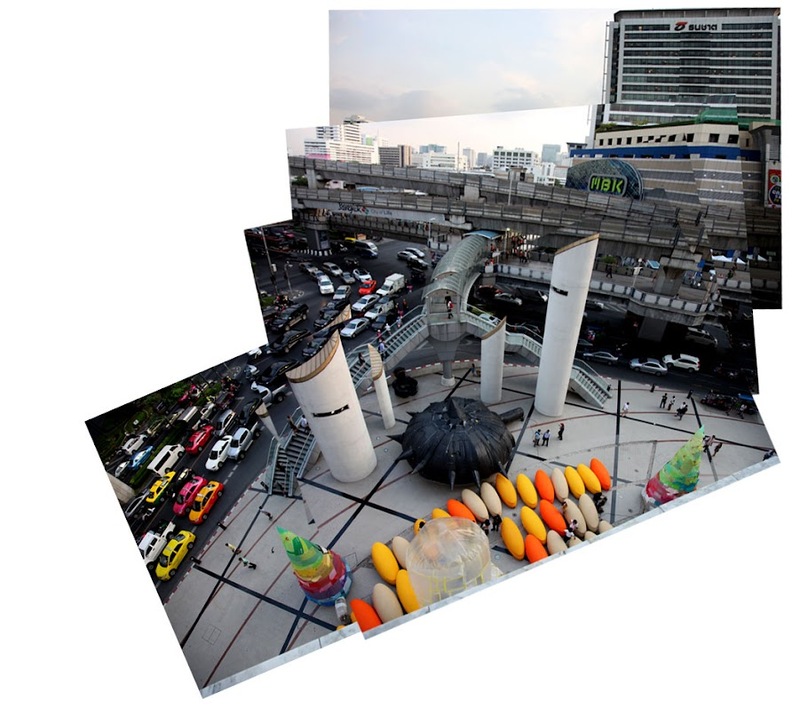 The work was carried out at the Bangkok Art and Culture Centre (BACC). During four days we washed, perfumed, repair, put them a sunday dress …We have spent a lot of time taking care of the plastic bags, healing them, learning to value them and reuse them.